Nintendo’s little handhelds are no stranger to music synthesisers. The DS, with its touch-screen input was the perfect home for a little digital Korg synthesizer back in 2008. A full-fledged music creation suite, it paved the way for a similar music apps not just on handhelds, but mobile phones too. 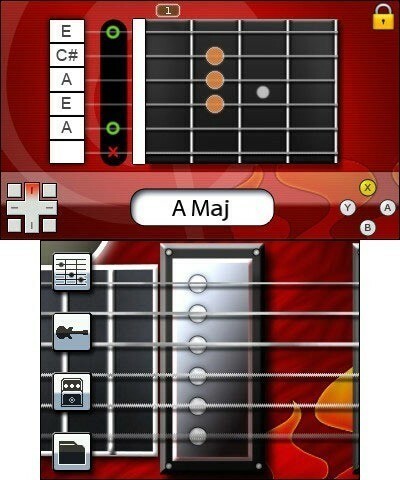 One such app, Music On: Electric Guitar simulated as best it could, the full electric guitar experience as part of Nintendo’s DSiWare in 2010. It’s been re-released for the 3DS, and is now available on Nintendo’s eShop. It’s not a game in any sense of the word; its sole purpose is to accurately simulate the guitar-playing experience. And not like Guitar Hero or Rock Band might, either. This a no-frills digital electric guitar. There are no notes to match up, no pre-set songs to play through and no tutorials on how to use it. It rather assumes you already know your way around a guitar, and invites you to start jamming. It does this with varying degrees of success. When you load the app up, you’re given a bare-bones display of a guitar’s frets on the top screen, and the area between the pickups on the bottom touch screen. Here’s where you’ll do your strumming, which mostly works as expected. Use your stylus to strum a string or a series of strings, and the low-quality sounds of a tinny, faux digital guitar fill your ears. Playing with different intensity registers, so you’re able to affect how much resonance you get from the strings – and also play around with vibrato. Unfortunately, it’s held back a bit by the resistive touch-screen on the 3DS itself, which is neither responsive nor multi-touch, so you can forget about pinching strings that aren’t right next to each other, or any sort of fingerpicking that deviates from relatively simple arpeggios. Strumming largely works though, and one of the four option on the main screen gives you a fret-board allowing you to play individual notes, transposed up or down by three frets. If you want to play chords though, things get a little trickier. Because the 3DS only has one touch screen so you can’t finger the chords yourself, you’ll have to make do with using the d-pad or circle-pad to switch between 8 chords mapped to the cardinal directions that you’re able to select. It’s weird and awkward to use – and requires learning where you’ve set each chord. It’s also jarring switching from chord to chord, as there’s no sustain on the previous chord, so it just cuts out to a short bit of silence before playing the next chord you strum. Frankly, it sounds awful. As a positive though, it does feature an extensive chord library; there are 900 of the things for you to choose from, displaying their shapes and fingerings. 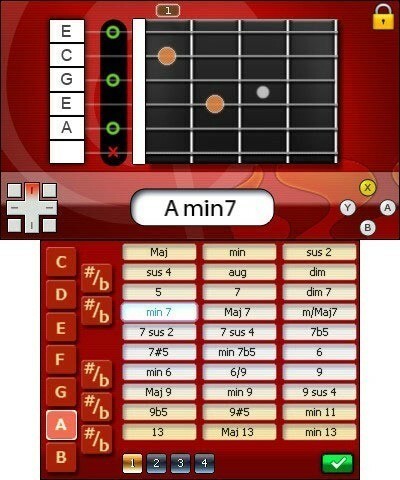 For me, this app works better as a chord reference than as a digital guitar. It has got a neat selection of effects peddles that you can play with, using your stylus to change the pitch, feedback and tone of the distortion, flanger and delay peddles. You can even set which order you’d like them to register, so it’s possible to create sounds approximating the sort you’d get out of low-end Virtual Studio tech. Unfortunately, the lack of ability to save what you play and then use it to interface with other apps or systems makes it very nearly useless – especially in an era where we now have things like the far superior, multi-instrument Garage Band on iPad – and similar apps on phones – for those moments where you just need to play, but don’t have an instrument handy. It’s bland, isn’t as functional as it should be, and has been superseded by far better apps that you can use on your phone. Where it had some use 5 years ago when it was originally released on the DS, there’s really very little reason for Music On: Electric Guitar to exist anymore.